I didn’t mean to spend 14 hours in the car today. After I left Yellowstone, I thought that I would probably drive to a campground in Idaho, spend the night, then drive to the Seattle area for another family reunion–this one with my west coast cousins. Once I started to look for a campsite in Idado, I ran into trouble. A sign on the road would say, “Camping.” So I would take the exit, drive for five or six miles and never see a campground. On one of these excursions from I-90, the sign said, “Campground 1/2 mile.” I drove about three or four miles, then the sign said, “Campground 1/4 mile.” I drove a few more miles, then turned around. When I was able to find a campground, I was unsatisfied. I didn’t expect Yellowstone, but I also didn’t want to be in a campground that looked like it was in some guy’s backyard with tents a few feet apart. 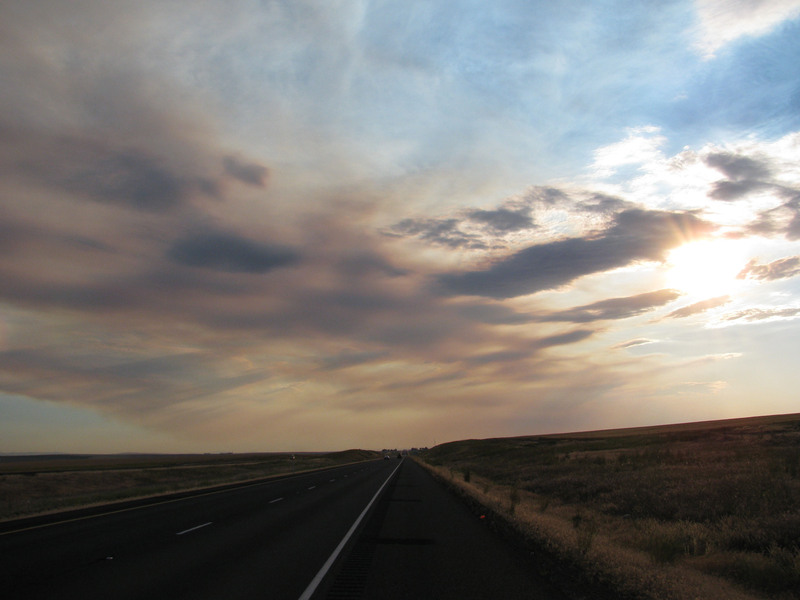 As I kept driving, the land flattened, the temperature rose, and I found myself in eastern Washingon. As I drove on, I kept saying, “I hate eastern Washington.” Then I realized that the terrain was a lot like eastern Colorado, and I thought that was pretty. I began to realize that I was having withdrawals from Yellowstone. I felt okay in Montana, not so bad in Idaho, but I had full-blown DTs once I hit the Washington state line. I eventually decided to give up on camping and checked into a hotel in Lake Someplace, I don’t really know where, but there’s a lake. It’s kind of pretty. Is Eastern Washington really that bad? Yellowstone definitely does seem like its own contained world but that sunset is not bad either. Agreed. I was badmouthing eastern Washington about the time I saw the sunset. Every place I have been so far has had its own charm. This is an amazing country. We are blessed.